Yellowstone super-volcano has a different history than previously thought, according to a new study by a Virginia Tech geoscientist. Scientists have long thought that Yellowstone Caldera, part of the Rocky Mountains and located mostly in Wyoming, is powered by heat from the Earth’s core, similar to most volcanoes such as the recently active Kilauea volcano in Hawaii. However, new research published in Nature Geoscience by Ying Zhou, an associate professor with the Virginia Tech College of Science’s Department of Geosciences, shows a different past.Yellowstone super-volcano eruptions were produced by gigantic ancient oceanic plate. This is the location of the Yellowstone’s hotspot track. 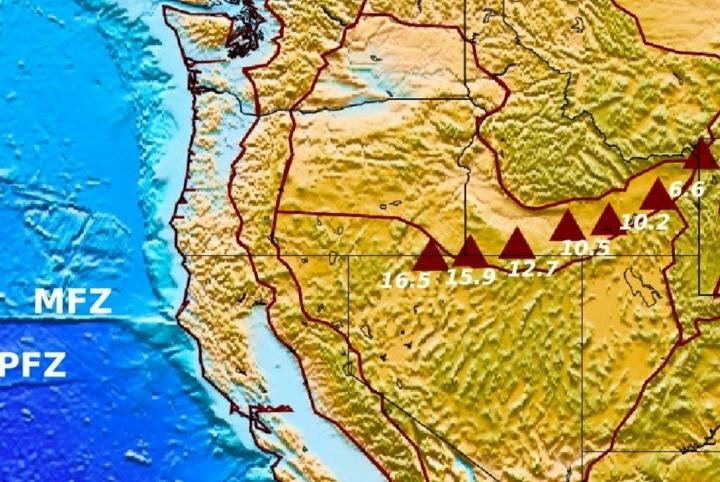 The triangles indicate general locations of the Yellowstone and Snake River Plain age-progressive volcanoes with ages shown in millions of years, plotted on a topography map of the Western United States. The previously-held plume model was used to explain the unique Yellowstone hotspot track – the line of volcanoes in Oregon, Idaho, and Wyoming that dots part of the Midwest. “If the North American plate was moving slowly over a position-fixed plume at Yellowstone, it will displace older volcanoes towards the Oregon-Idaho border and form a line of volcanoes, but such a deep plume has not been found.” Zhou said. 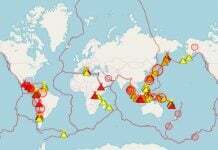 So, what caused the hotspot track? 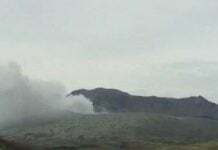 “It has always been a problem there, and scientists have tried to come up with different ways to explain the cause of Yellowstone volcanoes, but it has been unsuccessful,” she said, adding that hotspot tracks are more popular in oceans, such as the Hawaii islands. The frequent Geyser eruptions at Yellowstone are of course not volcanic eruptions with magna, but due to super-heated water. The last Yellowstone super eruption was about 630,000 years ago, according to experts. Zhou has no predictions on when or if Yellowstone could erupt again. 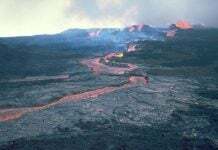 The origin of the Yellowstone and Snake River Plain volcanism has been strongly debated. The mantle plume model successfully explains the age-progressive volcanic track, but a deep plume structure has been absent in seismic imaging. Here I apply diffractional tomography to receiver functions recorded at USArray stations to map high-resolution topography of mantle transition-zone discontinuities. The images reveal a trail of anomalies that closely follow the surface hotspot track and correlate well with a seismic wave-speed gap in the subducting Farallon slab. This observation contradicts the plume model, which requires anomalies in the mid mantle to be confined in a narrow region directly beneath the present-day Yellowstone caldera. I propose an alternative interpretation of the Yellowstone volcanism. About 16 million years ago, a section of young slab that had broken off from a subducted spreading centre in the mantle first penetrated the 660 km discontinuity beneath Oregon and Idaho, and pulled down older stagnant slab. Slab tearing occurred along pre-existing fracture zones and propagated northeastward. This reversed-polarity subduction generated passive upwellings from the lower mantle, which ascended through a water-rich mantle transition zone to produce melting and age-progressive volcanism. Judgement from God! Northern California Fire (Carr Fire) selected the houses to be burnt down! I want to look at the scene of God’s Judgement. 2 houses are next each other. One house was completely burnt down to ash, and next house was intact. Fire stopped at the boarder line of the properties. On good people’s house, even dry grass are NOT burnt at all. Starting at 1:32 ~ 1:33 on the video below, you can see the front yard of dry grass is intact along the house, but the next house was completely burnt down to ash. Please focus on the property boarder line where the fire stopped completely. I do not know how God judge who is good person or not. But you cannot deny this is the judgement from God. At 0:22 on the video above, you can see again! the judgement of God. The house in the front was completely burnt down to ash, but look at the white house behind! This house is not only intact but also does not have even black soot from the smoke. The house in front burnt down with extreme temperature, but this white house has even INTACT old wooden fence. Isn’t it amazing? This is the judgement of God, which houses are burnt down, and which houses are saved. If not, tell me what it is. Starting at 0:36, again, you can see 2 houses intact just behind many houses were burnt down to ash. You can even see the green grass in the front yard. God has decided that those houses were owned by good people: therefore; he had decided to spare those houses along green grass in the front yard. This is the judgement from the God. Accepting Jesus as your savior is NOT enough. Do you (readers) think Jesus prepaid your sins in thousands years ago?? Change from money and self-oriented to love and peace oriented is the key to save yourself. Try to reach higher dimension of Christ consciousness. I’ve found a glowing light orb kind of UFO crossing Sacramento River. Starting at 0:58~1:00 on the video above. If you stop this video at 3:01, you can see green grass just beside the melted car. You can also the house behind the burnt down house was INTACT! All the trees and small plants were INTACT except the house owned by rich reptilians. Look at the scene at 4:05, beside the burnt down house, there is beautiful long green grass, and trees with pink flowers. You cannot deny the house was selected and targeted to be burnt down. Shasta state historic park had been burnt down in Carr Fire. This is the surface facility of Reptilian Secret Underground Base. On this historic park, they have pink brick Freemason lodge, cave entrance to their underground base, and strange tall tower structure to appeal to their outer space bases. On this video, you can see so many orbs around this explosion of transformer. Where transformer is, where Reptilian Secret Underground Base is. Toronto is the biggest city in Canada. There should be a huge reptilian underground cities or bases, too. A big fire in a suspicious facility with barbed wires. Reptilian Secret Facilities are always surrounded by barbed wires. More than 300 heavy stones of grave yard destroyed in Japan. People are saying that more than 20 people needed to create this kind of destruction. In the same day, the grave yard near this place got the same destructive condition. My guess is Galactic Federation of Light or Holy entities destroyed those useless grave yard, especially, those grave yards are related to religions created by reptilian entities. After human bodies died, souls are going to be sent where they belong (recycled back to the Earth to reincarnate, or sent to some other planets or dimensions). So basically, grave yards are really wasting land just to keep the dead bodies. If you (readers) like to communicated deceased relatives or friends, you can do it at home by meditation. Or you can see them while sleeping. Your soul can move out from your body and can go to another dimension to see them while you are sleeping. Your name should be nutjob from Alabama, you freaking bible thumping lunatic.